My wife and I live an hour north of San Francisco near the coast on a family farm. We have 4 grown children and 2 grandchildren so far (our son and grandson are pictured on the surfboard just off Kamaole Beach across the street from the condo). I am a general contractor and my wife works at our local community clinic. She also grows a variety of fruit which she makes into jam and sells to local stores. We make it down to Kihei 1 to 3 times a year and have had some great family vacations there. We first visited Maui on our honeymoon in 1974 and have enjoyed going back over the years. 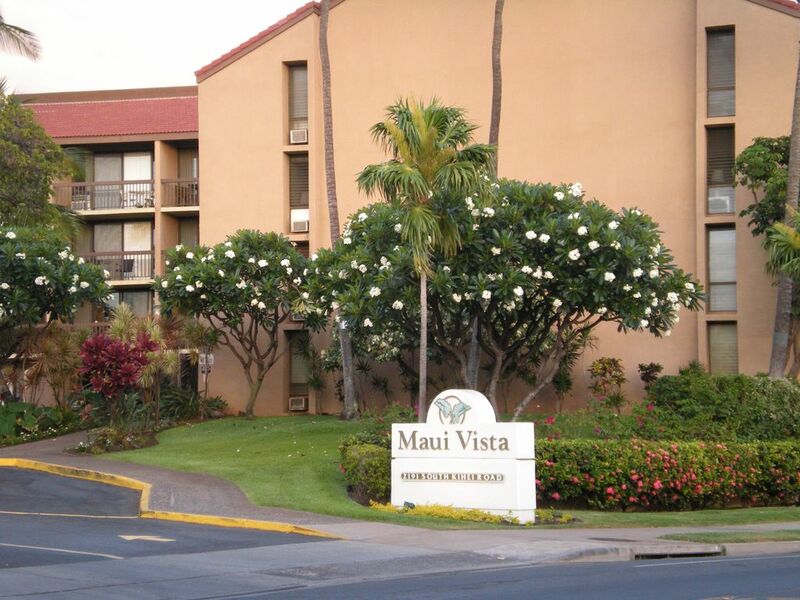 When looking to buy a condo we found Maui Vista to have all the things we were looking for - convenient access to a family-friendly beach, beautiful grounds, tennis courts, and walking distance to great restaurants and shopping. A/C in living room. There is a ceiling fan in the bedroom. Free parking for 1 car is included. It was clean and tidy. On kam beach one was convenient. Property similar to kamaole sands. Property was ok and had adequate amenities, however, wasn't as clean as expected. There was dust, dirt and a used toothpick/floss behind the night stand and dirt and lint on the ceiling in the bedroom. Wifi and AC were available, however neither was powerful enough to reach the bedroom. Bathroom was clean, and there were pots and pans available for cooking in the kitchen. Could be a great place if cleanliness was improved. Unhesitatingly would recommend. Natalie is the best! We loved our stay here. Natalie, the manager, is the best. We are a couple in our 50s and this was perfect for us. Check-in was smooth, parking was easy, and the apartment was perfect for our needs. It is easily within a 6 minute walk to a beautiful beach, and convenient to shopping.. The unit is located on the third floor in the back of the complex, but we really liked how quiet it was. We only heard the tennis players one or two mornings. Natalie answered all questions promptly, and was extremely helpful. We found the entire apartment to be well-stocked. There was a starter kit of soap and toilet paper, paper towels, detergents, trash bags, etc. There was an endless supply of laundry detergent, towels, linens, and beach necessities. It was wonderful to be able to do a load of laundry when needed. The apartment was clean and there was no problem with bugs of any kind. Plenty of books and DVDs were provided and the TV worked fine. The AC isn’t super adequate, and we definitely needed the fans in the bedroom, but my husband slept in the Murphy bed near the AC unit at night, and we both slept comfortably. The plumbing drains a little slowly, but we had no real problems. Having a dishwasher and full-size fridge was wonderful. The seating for dining was great and the furniture, although not new, was comfortable. The master bed, and the Murphy bed, were both comfortable. The balcony and balcony furniture were really nice. We found the WIFI to be a little slow, but using our data wasn’t a problem for us. The WIFI didn’t reach into the bedroom, but I’m not sure if that was a problem with my iPad and LG phone, or with the signal. Overall, I would unhesitatingly recommend this apartment, this complex, and Natalie, the manager. Very nIce place and wonderful people! Thank You Natalie! The home was very nice and Natalie was great to work with. She followed up with all of our questions and communications before, during and after our stay. It is a clean, quiet, relaxing comfortable home and had everything we needed. The instructions were easy to follow and working with the Natalie was very easy and a pleasant experience. We are planning a return visit in October and we will be working with Natalie to stay again in October. Perfect area to stay in kiehi. Property is good location. Just enough room for me and my wife. Traveling as a family of 4 with 2 younger boys, this rental was the perfect Hawaii experience and well located to take care of everything Kihei has to offer. The property is located across the street from Charley Young Beach Park (Top 10 in the USA), numerous local dining and grocers, cafe's and activities. Well located for any direction you plan for your day, and close enough in proximity to everything else. Although not listed, the amenities in the unit were far more than we expected, including the boogie board, mask and snorkel, fins, cooler, umbrella, beach towels, tennis rackets and everything else you would need. All less than 30 minutes from Kahului Airport! Maui Vista is located across the street from Kamaole Beach Park I (Charley Young Beach), which is one of three beach parks in south Kihei that are all connected with walking paths perfect for a morning or sunset stroll. Each of these beaches offer soft white sand, gentle waves for swimming or boogie boarding, and small reefs at each end for snorkeling. You can walk to restaurants, grocery stores, and shops.The Shops at Wailea are a 10 min. drive for shopping, live entertainment, and great restaurants. The Condo complex is non smoking except in designated outdoor locations. CANCELLATION: If you cancel your reservation prior to 45 days before arrival date we will refund your deposit minus a $75 cancellation fee. If you cancel less than 45 days prior to your arrival date we will refund up to 90% of your rental amount if we are able to re book your dates. The refund amount will depend on how many of the booked dates can be re booked.